Danville, Pa.-based Geisinger Health System, an integrated delivery network with 12 hospital campuses, a 1,600-physician multispecialty group practice and a 551,000-member health plan, recently completed the acquisition of Commonwealth Medical College in Scranton, Pa. In January, Geisinger announced what it's calling Springboard Healthy Scranton, a multiyear program aimed at improving community health by promoting healthier eating and lifestyle changes coordinated with chronic care management. 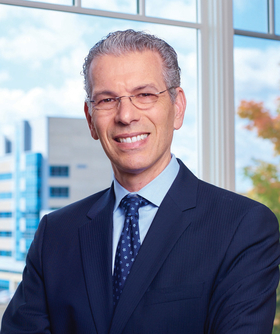 Modern Healthcare reporter Dave Barkholz recently spoke with Geisinger CEO Dr. David Feinberg about these and other developments. The following is an edited transcript. Modern Healthcare: Why did you buy a medical school? Dr. David Feinberg: It was a great coming together of an organization and a medical school. Both have been really focused on community-based, innovative kind of post-Flexner medical care. It's a perfect combo. And for us, it's a way to say (to prospective students), “Do you want to be trained in one of America's most innovative systems?” It's also important for us for workforce development. We don't think every Geisinger Commonwealth School of Medicine student will become a Geisinger resident. And not every Geisinger resident will become a Geisinger faculty. But we think we'll increase our percentage long-term by building our own farm league. MH: : What are your plans for Scranton? Feinberg: Scranton is a typical kind of U.S. city—post-industrial, diverse with high rates of substance abuse, high rates of obesity, high rates of unemployment and high rates of diabetes. We said, “Let's stop complaining about social determinants of health, and let's fix them.” We've put together at Geisinger an advisory board of incredible people who have done this kind of social entrepreneurship before. We then went to Scranton, met with people who are already doing that work, and, most importantly, we met with folks who are already getting those services. We listened. We said, “What can we do so that nobody suicides here, that everybody has access to food, everybody has access to healthcare, that we stop child abuse?” We've been working at it for about a year, and we've already seen the needle move considerably. We think if we get it right there, it becomes a model we can take to other communities and around the country. MH: What are the interventions? Feinberg: We're going to run everyone's genome. We'll know whoever is BRCA-positive, whoever has a familial hypercholesterolemia, cardiac arrhythmia genes, etc. We're going to make sure that everybody has access to food. We've already done that in other parts of our catchment area. …Not only have we given people a healthier future, we've given them hope back. So, we're taking that food program throughout Scranton. We're using a lot of data to understand patients who are frequent flyers in our emergency room. How do they interact with the criminal justice system? We're putting together all kinds of databases to understand these individuals much better so we can intervene. The last pillar is the community. We've been in this community for a while. We have our med school there. We've got hospitals there. It's saying to the community members, “What can we do? What programs have been here before that have worked or haven't worked so we can help tweak them?” It's a partnership. MH: What's it going to cost, but what's it going to save? Feinberg: We're not sure yet of the total cost. We think it's going to save lives, and it's going to ultimately be sustainable and save money. We really think it will demonstrate that it decreases healthcare cost and thus becomes sustainable. MH: How is your genome sequencing program working out? Feinberg: We do this across our entire area. We say to patients, “Can we look at your whole genome?” Ninety percent of them say yes, which is just incredible. It shows trust in the organization. We look at their medical record. We look at their family history. We look at that genome. (Then) it's time to have a conversation with that patient. “You have something, in essence, a time bomb, and there's something we can do about it.” That conversation takes place with a primary-care provider and the patient, supported by genetic counselors and geneticists. The patient and family decide what to do next. The cases have been unbelievable. A sixteen-year-old girl comes in dehydrated from soccer. We give her some fluids. She participates in our MyCode study. It turns out she has two genes associated with fatal cardiac arrhythmias in young adults. We treat 30 people in her family. Uncle Bill, let's call him, choked in a restaurant and died two years ago. Well, in retrospect, he didn't choke. He had a heart attack. She wasn't dehydrated. She was having her first sign of a cardiac abnormality. Now we bring in the 30 family members, and some of them need to get pacemakers because we've now figured out the genetic risk that's associated with some of them. Some need monitoring, and some we can say, “You're good, but this is in your family, and we should check your kids in the future if that's part of your life.” We can make amazing changes in people's lives by having this genetic information and combining it with the clinical information. MH: How big is your repository now? Feinberg: We've consented over 150,000 patients to look at genomes. Our average electronic health record is 14 years old. We have all the claims data if they were insured by us. In Central Pennsylvania, there's a stable population, so we have multigenerational information. We think we'll be at 250,000 patients at the end of this calendar year. MH: You announced your plan to get this health system to zero wait in the ER. How are you going to do that? Feinberg: We're going to do it by setting it as a goal. When you come to the ER, it's a real hassle. I've never seen anybody's appendix, broken arm or suicidality get better in a waiting room. It is a non-value-added place. So, the way to do it is not only re-engineer the ER, but also to decant the pressure on the ER. What can we push to urgent care? What can we push to online? If we improve access, which we've worked on with our specialty care for nonserious conditions, you see a decrease in use of the ER. So a lot of getting to zero minutes in the ER is getting stuff out of the ER that shouldn't be in the ER. That means primary care, urgent care, telemedicine and specialty care. MH: Where are you now with your wait times? Feinberg: We're still terrible. I don't know, maybe 200 minutes—not the wait to be seen, but the wait to be treated. We're like anyone else. We should get people who are not hospitalized in and out of the ER in under 50 minutes or for hospitalized patients, in your hospital bed upstairs within an hour to an hour-and-a-half. MH: What's the rationale for offering same-day access for seeing a physician— better patient care or higher patient satisfaction? Feinberg: It's both. Not only is it satisfying for patients to get seen, it also makes great business sense. It decreases unnecessary care in the ER. It decreases anxiety. It's just changing our frame of reference from being provider-centered to being patient-centered. Every other business has that kind of access. If you want to watch TV, you can download whatever movie you want now. Healthcare is just so far behind. We want to disrupt ourselves. MH: You've changed the way you incentivize physicians. What are you after? Feinberg: Every doctor at Geisinger at a minimum—at a minimum—is paid at the 50th percentile or above. So we don't pay anyone below average. In exchange, we ask our docs to do five things: take great care of patients; treat patients like they are your family; help us with same-day access, so occasionally that means staying late, occasionally that means coming in on a Saturday; help us with recruitment and retention, because we want to make it a great place to work; be engaged in our teaching and research, talk to patients about the genome study; and finally, be a good citizen—run on time, don't use foul language, volunteer for committees, that kind of stuff. If you do those five things, we're going to pay you. It doesn't say how many surgeries you do, how many patients you see. It's not volume-based. If one of our docs needs to spend an entire morning with one patient organizing everything, that meets what we're looking for. Those are the docs we're looking for. We want people who know how to take care of patients the right way. MH: What have been the results so far? Feinberg: The results have been fantastic. We've seen a better retention than we think anywhere in the country. Our turnover last year was just under 5%. I go over every single doc who leaves Geisinger. I want to know why. And I would tell you now every one of those is, “I'm a hospitalist and I want to do a fellowship,” and we don't offer it. Or, “My family is moving,” or, “We have kids now, and the grandparents are in Florida, so we are going to move there.” We don't have anyone leaving because they're burned out. We've really eliminated that. Our recruitment has been phenomenal. We brought in hundreds of new doctors, and they're fantastic. Geisinger has a pretty good brand name.